Vinyl flooring is a popular choice for homeowners because of their versatile, water-resistant and durable features. Many homeowners favour installing vinyl flooring in high traffic areas, such as bathrooms and kitchens to create an easier to clean environment. Vinyl floors are also an affordable option when compared to other flooring types and come available in a full range of fantastic colours and patterns. Here are some excellent tips you can use to help maintain your vinyl floors. You should prevent your vinyl floors from becoming stained as much as possible. This can be helped by using excellent mats at the entrances of your home and rooms that trap can dirt and harmful chemicals. Without the use of an entry mat, you could spend added time cleaning the floors. It is best to sweep or hoover your vinyl flooring at least once a day. Regular cleaning helps to reduce the amount of dirt that settles on your floor, making it easier to clean each time and ensuring the appearance is always fantastic. You don’t need to use heavy-duty cleaners to rip dirt off from your vinyl floors, instead, you can use mild cleaners which helps minimize causing wear and tear on your vinyl flooring. If any spills do occur, you should wipe these as soon as possible so they don’t become dry and begin sticking to your floor. If you spot any challenging areas, you can use a dampened mop to soak and remove a dried spill, rather than using a broom to scratch it out physically. Ensure to also use soap that is designed for vinyl flooring to avoid products which could discolour your floor. Soap can sometimes deposit residue on vinyl floors which can quickly attract dirt and grime. To counteract this you should rinse your floors after the initial cleaning to remove any remaining soap particles. If you’re planning to place large furniture items or appliances (such as refrigerators and tables) onto your vinyl floor, then be aware that these can sometimes dent the surface due to their heavy weight. To prevent dents, you can fit floor protectors onto your furniture and large appliances. 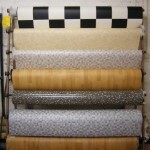 Floor protectors are designed to reduce the impact of the weight of the appliances on your vinyl floor. When water seeps through the cracks and seams existing on the vinyl floor, it can damage the glue bond that exists between the floor and the vinyl material. This can cause the vinyl to twist and become relaxed, thereby damaging the appearance. Overall, compared to other types of flooring vinyl floors require much less maintenance to retain their quality and versatility, so they can be an exceptional choice for your home. If you have any questions or you are considering vinyl flooring for your home, simply give us a call today or send us a message via our online form.